LATERAL KINDNESS – Pass it on! Option 2 – The ‘to’, ‘from’ and body of the kindness gram is fillable. Join the lateral kindness movement and send a kindness message to lift someone’s spirit! 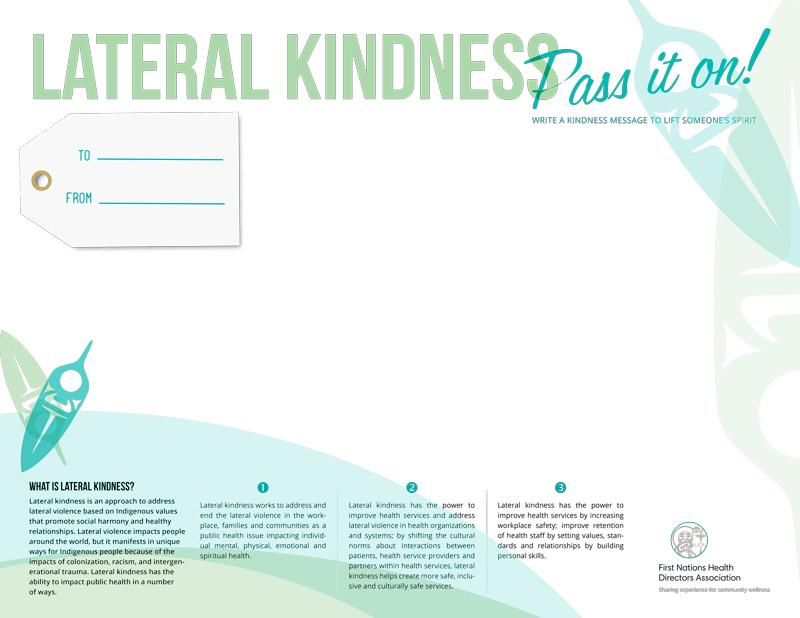 The FNHDA supported the development of “lateral kindness” as a concept and promotes this concept as a way to address lateral violence and strengthen First Nations health governance in BC. Together, the First Nations Health Authority (FNHA), First Nations Health Council (FNHC), and FNHDA champion lateral kindness in practice, policy, partnerships, and professional development in health services, provide a model for promoting lateral kindness and ending lateral violence within the healthcare system. Lateral kindness works to address and end the lateral violence in the workplace, families and communities as a public health issue impacting individual mental, physical, emotional and spiritual health. Lateral kindness has the power to improve health services and address lateral violence in health organizations and systems. By shifting the cultural norms about interactions between patients, health service providers and partners within health services, lateral kindness helps create more safe, inclusive and culturally safe services. Lateral kindness has the power to improve health services by increasing workplace safety; improve retention of health staff by setting values, standards and relationships by building personal skills. The FNHDA Position Statement issued a decree of 13 actions (in remembrance of the phases of the moon). It calls all those who share the same values to take a stand against lateral violence and strive to ensure wellness in physical, spiritual, mental and emotional health on an individual and collective basis. By fostering an environment based on our values of respect, discipline, relationships, culture, excellence and fairness, these 13 actions promote the end to lateral violence in the name of peace, productivity and prosperity and take advantage of the FNHDA’s readiness for remedial interventions. The FNHDA calls upon everyone to action, to get involved and be a part of finding and determining solutions towards a zero tolerance of any form of lateral violence. In response to the FNHDA Position Statement, the FNHDA, FNHC, and FNHA committed as a collective to the Joint Declaration of Commitment on Lateral Kindness. The three entities support one another as a collective and respond to lateral violence by using traditional teachings about respect, fairness and the importance of relationships to create an environment built on the foundation of kindness. As partners in our First Nation Health Governance Structure, our journey of health transformation is guided by our shared vision and values. It is through our shared values and vision of “Healthy, Self-Determining and Vibrant BC First Nations Children, Families and Communities,” that we seek to create transformative change in First Nations health and wellness.